A regular breeding species and migrant in Minnesota forests; the Eastern Whip-poor-will was an uncommon species during the Minnesota Breeding Bird Atlas (MNBBA). Largely restricted to the eastern deciduous forest biome, the Eastern Whip-poor-will is found in southern Canada, from central Alberta east to the Maritime Provinces, and in the north-central United States south as far as northern Arkansas and east to South Carolina. The Eastern Whip-poor-will is sparsely distributed throughout its range; the limited data available for this crepuscular species suggest that the highest breeding densities occur in the Central Hardwoods Region of southern Missouri (Figure 1). Assigned a Continental Concern Score of 14/20 and placed on the 2016 Yellow Watch List by Partners in Flight; designated a Species in Greatest Conservation Need by the Minnesota Department of Natural Resources. A medium-distance migrant that winters along the Gulf coast and in Central America. Eggs are laid directly on the forest floor. Breeding distribution and relative abundance of the Eastern Whip-poor-will in North America based on the federal Breeding Bird Survey, 2011–2015 (Sauer et al. 2017). As the woods and undergrowth were thinned and destroyed to make way for the developing city, the call became less and less frequent until now it is rarely heard, only an occasional passing bird, spring and fall, stopping for a night or two to utter a mournful requiem for its numerous, long-since-departed fellows. Although the species was largely absent at the time from developed regions in the state, it remained locally common in areas where forests had been left undisturbed. Roberts reported 5 nesting records, which stretched from as far south as Wabasha and Goodhue Counties in southeastern Minnesota, to Hennepin and Stearns Counties in central Minnesota, and north to Lake of the Woods County on the Canadian border. The Lake of the Woods report was only of a nest; all others were nests with eggs. Many years later, Green and Janssen (1975) wrote that whip-poor-wills were a summer resident throughout the state’s forested regions, although very scarce in northeastern Minnesota and the adjacent counties of Itasca and Koochiching. Absent from the western grasslands, it was most abundant in southeastern Minnesota as well as in several northwestern and north-central counties, specifically Beltrami, Clearwater, Lake of the Woods, Marshall, and Roseau. In a review of the species’ summer distribution in 1985, Wilson noted the whip-poor-will was widely distributed across Minnesota’s woodlands. Nevertheless, “it occurs only locally, failing to occupy most forested habitats” (Wilson 1985). An updated account a few years later by Janssen (1987) remarked that whip-poor-wills were “numerous” along the Mississippi River. Elsewhere the species was “well-represented” in the Anoka Sand Plain Subsection, on the northern edge of the Twin Cities metropolitan region, and farther north, in northwestern and north-central Minnesota. Nevertheless, since 1970, nesting had been confirmed in only 6 counties: Anoka, Lake, Marshall, Polk, Sherburne, and Washington. By 1998, Hertzel and Janssen had added only 1 additional county, Winona. By 2014, the Minnesota Biological Survey had reported 67 breeding season locations for whip-poor-wills during its field studies. The majority of records were confined to the Laurentian Mixed Forest and Tallgrass Aspen Parklands Provinces. Within the Laurentian Mixed Forest Province, there were two centers of abundance; one in northern St. Louis and Itasca Counties, and a second in the Brainerd Lakes area, including portions of Crow Wing, Morrison, Wadena, and Hubbard Counties. Several records were also found within the Minnesota River valley as far west as Yellow Medicine County and as far south as the county line between Cottonwood and Murray Counties (Minnesota Department of Natural Resources 2016). During the MNBBA, participants reported 214 Eastern Whip-poor-will records in 3.3% (155/4,747) of the surveyed atlas blocks and in 2.7% (63/2,337) of the priority blocks. Breeding evidence was reported in only 6 blocks (Figures 2 and 3; Table 1). In total, the birds were reported in 28 of Minnesota’s 87 counties and were reported nesting in 7 counties; 1 block with confirmed nesting in the Minnesota River valley straddled 2 counties (Redwood and Renville). Despite the difficulty of surveying this crepuscular species, atlas records reaffirm its patchy distribution. The majority of records were located within the Laurentian Mixed Forest and the Tallgrass Aspen Parklands Provinces. Records in southern Minnesota were largely limited to the Anoka Sand Plain Subsection, southeastern Dakota County, eastern Goodhue County, and the upper Minnesota River valley. The extent to which the species’ range has changed in the past 100 years is not entirely clear, but certainly the major river valleys of southeastern Minnesota no longer represent the species’ stronghold in the state as noted by Green and Janssen (1975). Although many states have noted major population declines and local extirpations due to the loss of forest cover, no major change in the whip-poor-will’s overall breeding distribution has been documented. Nearby, the species disappeared from North Dakota decades ago (Cink et al. 2017). In Ontario, Ohio, and Michigan, the number of townships and/or blocks reporting whip-poor-wills declined 50% to 58% between completion of their first and second atlases, but its overall distribution changed very little (Cadman et al. 2007; Rodewald et al. 2016; Chartier et al. 2013). In Wisconsin, the state’s first atlas documented that although the species still occurred across the state, its distribution had become “much more patchy and disjunct” than depicted by earlier accounts (Cutright et al. 2006). Breeding distribution of the Eastern Whip-poor-will in Minnesota based on the Breeding Bird Atlas (2009 – 2013). Summary statistics of observations by breeding status category for the Eastern Whip-poor-will in Minnesota based on all blocks (each 5 km x 5 km) surveyed during the Breeding Bird Atlas (2009-2013). Summary statistics for the Eastern Whip-poor-will observations by breeding status category for all blocks and priority blocks (each 5 km x 5 km) surveyed during the Minnesota Breeding Bird Atlas (2009-2013). Open woodlands have traditionally been considered the Eastern Whip-poor-will’s preferred habitat. Although they select a wide variety of forest cover types, a degree of openness in both the canopy and understory is a common feature of either the site itself or its immediately adjacent habitat (Figure 4). Because the species forages at sunrise and sunset and during moonlit nights, open forests and forest edges provide more visibility during the foraging hours. Such habitats also enable this aerial insectivore to adeptly maneuver on the wing while its feeds. Whip-poor-wills are generally absent from extensive stands of uninterrupted forest unless natural or created openings exist. A recent study in Ontario demonstrated that in the northern boreal forest, open wetlands, recent clear-cuts, and recent burns all provided equally suitable habitat for the species (Farrell et al. 2017). Other important elements included available shade for nest sites and quality foraging sites with high insect availability (English et al. 2017). Wilson (1985) prepared a summary and analysis of sites known to support whip-poor-will populations in Minnesota in an effort to better understand the factors responsible for their patchy distribution. Even in the densely forested landscapes of northeastern Minnesota, the birds sought open forest habitats, including sites on the Iron Range, forest stands adjacent to managed forest openings, and sparsely vegetated bedrock outcrops. He points out, however, that there is a significant amount of apparently suitable habitat in Minnesota’s forest region that is not utilized by the birds. He suggested three explanations for their absence in these areas. First, many of the open woodlands present in today’s landscape are heavily grazed woodlots that simply are not suitable for the species’ ground nesting habits. Second, because many of these woodlots are adjacent to agricultural fields, the use of pesticides may have reduced populations of aerial insects to levels that cannot support local whip-poor-will populations. Indeed, evidence demonstrated the entire guild of aerial insectivores have experienced much larger population declines than other landbirds (Nebel et al. 2010). Finally, Wilson suggested competition with other aerial insectivores, most notably bats, may be a factor in some regions. At least a few studies have demonstrated that bats can outcompete and displace the whip-poor-will’s relative the Common Nighthawk in areas where both are competing for food resources (Shields and Bildstein 1979; Boyce 1980). Typical breeding habitat of the Eastern Whip-poor-will (© Eli Sagor). Although the federal Breeding Bird Survey (BBS) is not well suited to monitoring nocturnal species, it remains the only long-term monitoring data set for the Eastern Whip-poor-will. Biologists have used the BBS data to generate a North American population estimate of 1.8 million breeding adults (Rosenberg et al. 2016). In 2013 Partners in Flight estimated that Minnesota supported 1.7% of the North American population (Partners in Flight Science Committee 2013); applying that figure to the 2016 estimate generated a statewide population of 30,600 birds. Since the BBS began in 1966, it has shown a steady, range-wide decline in the number of Eastern Whip-poor-wills, averaging 2.8% per year and slowing to a rate of decline of 1.3% since 2005 (Sauer et al. 2017). In Minnesota the trend also has been downward, averaging 3.1% per year since 1966, and has actually declined at a slightly faster rate of 3.8% per year since 2005. These data, however, are not statistically robust, given the species’ sparse distribution and nocturnal habits. The only region in the United States where data were sufficient to be considered of moderate precision is in the Central Hardwoods, an area that stretches from southern Missouri and northern Arkansas east through the southern Ohio River valley, central Kentucky, and Tennessee. This is the only region where the average number of whip-poor-wills per BBS route is greater than 1.0; in Minnesota the average number of birds per route is only 0.06! 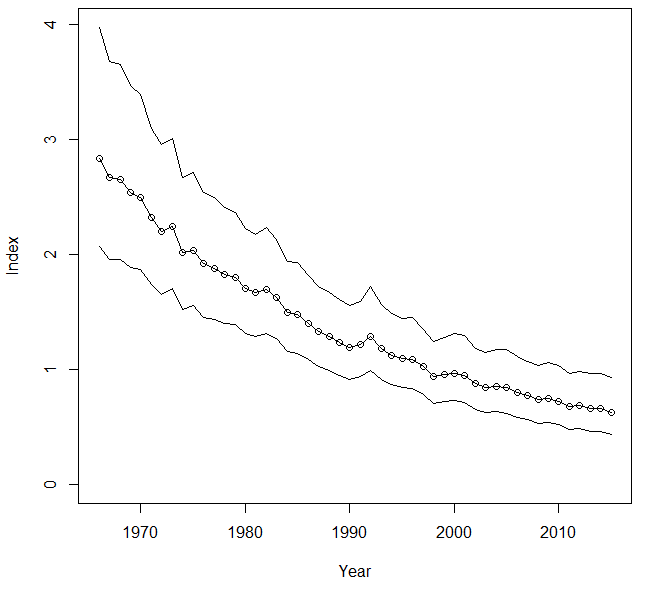 In the Central Hardwoods, Whip-poor-will populations have demonstrated a significant population decline of 3.02% per year since 1966 (Figure 5). In light of the challenges surveying Whip-poor-wills, as well as other members of the family, the Center for Conservation Biology recently launched the Nightjar Survey Network (http://www.nightjars.org/about/about-the-nightjar-survey-network/). The network solicits volunteers to conduct targeted surveys that are conducted at night in an effort to gather more information on the species’ presence and relative abundance. Since it began in 2007, several volunteers have conducted surveys in Minnesota that have recorded both Common Nighthawks and Eastern Whip-poor-wills, but these data are insufficient to assess population trends. Apart from the BBS data, there is abundant anecdotal information from ornithologists and birders alike that Whip-poor-will populations have declined. In addition to the explanations postulated by Wilson (1985), other likely explanations for the decline include the closure of forest openings due to forest succession, the invasion of open woodlots by aggressive understory species, such as buckthorn, and the loss of habitat due to agriculture and urban/suburban development (Cink et al. 2017; Cutright et al. 2006). A recent analysis of the influence of prey availability and suitable habitat on the distribution and abundance of Whip-poor-wills concluded that food availability was a leading factor in the species’ decline (English et al. 2017). Breeding population trend for the Eastern Whip-poor-will in the Central Hardwoods Region for 1966–2015 based on the federal Breeding Bird Survey (Sauer et al 2017). When Partners in Flight prepared their first comprehensive landbird conservation plan in 2004 (Rich et al. 2004), the Eastern Whip-poor-will had shown a range-wide decline of 58% since 1966, prompting its designation as a Common Bird in Steep Decline. More recently, in 2016, the species’ cumulative population decline increased to 69%, and the species was upgraded to Partners in Flight’s Yellow Watch List. Partners in Flight’s management goal is to stabilize the declining population in the short-term and eventually increase a portion of the population within 30 years (Rosenberg et al. 2016). In Minnesota, the Minnesota Department of Natural Resources (2015) has designated the Eastern Whip-poor-will a Species in Greatest Conservation Need. The designation was prompted by numerous concerns, including habitat loss and degradation and its rarity, confirmed by extensive surveys by the Minnesota Biological Survey. Although some attention to the bird’s plight has occurred in recent years, specific conservation recommendations are lacking until more intensive field studies are undertaken. Protecting naturally open woodland communities, such as the dry oak and aspen stands commonly found in the aspen parklands, and the oak savannas found on the Anoka Sand Plain, appears to be one critical component necessary for the species’ survival. In recent years several studies and reviews have highlighted the species’ potential sensitivity to warming climates. “The State of the Birds 2010 Report on Climate Change” (North American Bird Conservation Initiative 2010) classified the species as highly sensitive to climate change. A recent assessment of 588 North American birds by the National Audubon Society classified the whip-poor-will as a “climate endangered” species that could lose 78% of its current breeding range by the year 2080 (Langham et al. 2015; National Audubon Society 2016). Clearly a warming climate may only exacerbate the species’ current problems. Boyce, Mark S. 1980. “Possible Competitive Displacement Between Common Nighthawks and Bats in Southwestern Oregon.” Murrelet 61: 35. English, Philina A., Joseph J. Nocera, Bruce A. Pond, and David J. Green. 2017. “Habitat and Food Supply Across Multiple Spatial Scales Influence the Distribution and Abundance of a Nocturnal Aerial Insectivore.” Landscape Ecology 32: 343–359. Farrell, Claire E., Scott Wilson, and Greg Mitchell. 2017. “Assessing the Relative Use of Clearcuts, Burned Stands, and Wetlands as Breeding Habitat for Two Declining Aerial Insectivores in the Boreal Forest.” Forest Ecology and Management 386: 62–70. Shields, William M., and Keith L. Bildstein. 1979. “Bird Versus Bats: Behavioral Interactions at a Localized Food Source.” Ecology 60: 468–474. Wilson, Steven G. 1985. “Summer Distribution of Whip-poor-wills in Minnesota.” Loon 57: 6–8.